Summary: “In this third book in the Lunar Chronicles, Cinder and Captain Thorne are fugitives on the run, now with Scarlet and Wolf in tow. Together, they’re plotting to overthrow Queen Levana and her army. Their best hope lies with Cress, a girl imprisoned on a satellite since childhood who’s only ever had her netscreens as company. All that screen time has made Cress an excellent hacker. Unfortunately, she’s just received orders from Levana to track down Cinder and her handsome accomplice. When a daring rescue of Cress goes awry, the group is separated. Cress finally has her freedom, but it comes at a high price. Meanwhile, Queen Levana will let nothing prevent her marriage to Emperor Kai. Cress, Scarlet, and Cinder may not have signed up to save the world, but they may be the only hope the world has.” (Summary found on Goodreads). 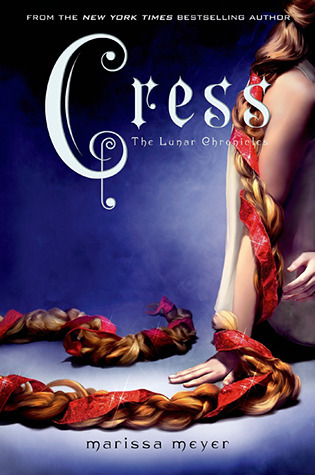 Cress is a great sequel in the Lunar Chronicles and I can’t wait to read the next book. The novel is written very well and I don’t have any problems with it. There is a little violence, but nothing too bad. Meyer hooked me from the beginning of the series and kept me through the third book. I can’t wait for the fourth book to come out. It is such an exciting series and I love the characters and plot. She writes with a high vocabulary, so younger readers wouldn’t understand it as well. The plot is very creative and I never imagined a dystopian fairytale. If you like this series so far, I highly recommend Cress.